Energy majors, such as Total, Royal Dutch Shell and BP, profited more from refinery runs in the first two quarters of 2015 due to strong gasoline demand than from the upstream crude oil production, as the latter has shown disappointing earnings since the collapse of the oil prices in the summer of 2014. Some refineries even delayed the yearly maintenance season to not miss out on the rare lucrative moment. A combination of factors, such as the 50-percent fall in crude oil feedstock prices, higher gasoline demand in West Africa, the Americas and parts of Asia, refinery maintenance and outages in the U.S., and a weaker refining output in non-OECD countries, boosted European refinery runs and margins. Energy majors, however, expect the refinery rally to be a short-term phenomenon. While overcapacity of European refineries could be one reason for an impending slowdown, more systemic reasons portend a longer-term decline that has already started over a decade ago. This article examines the state of the European oil refining sector in the context of domestic policies and the rapidly changing global energy landscape, implications of declining refineries in the EU on its economic and energy supply security, and the outlook for the industry. The latest boom of the European refining industry masks its general decline since the early 2000s. Around 22 European refineries closed since 2009  and more are expected to face closure from the remaining 84 plants. 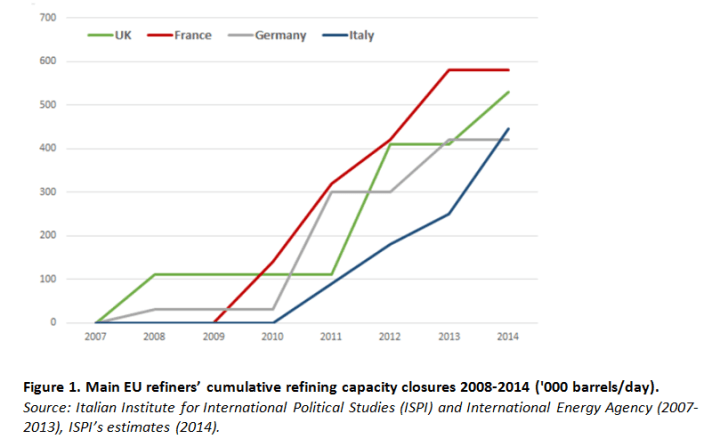 Four major European countries in refining – Germany, France, Italy, and UK – bore the brunt of the closures (see Figure 1). 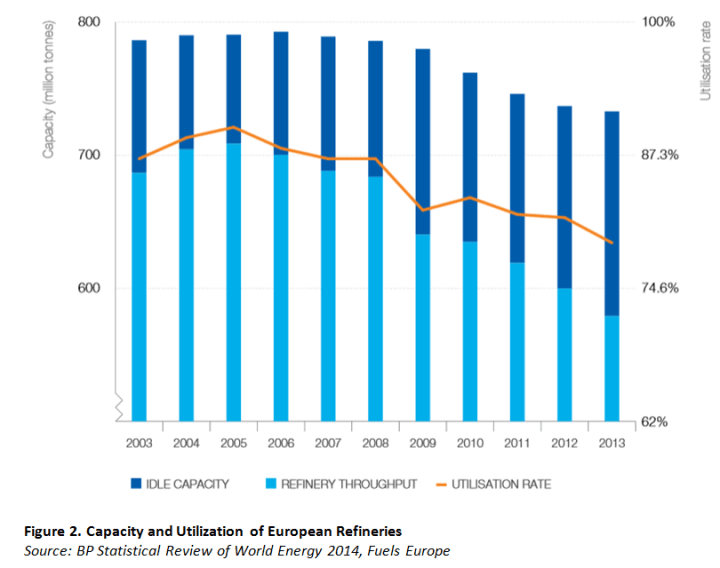 Europe’s refinery utilization rate fell from around 90 percent in 2005 to about 80 percent in 2013 (see Figure 2). Despite the closures, the remaining refining capacity in Europe still outweighs the domestic fuel demand, which has been mostly flat since 2005. And, irrespective of the current boom, European majors expect more refinery closures in coming years due to overcapacity, particularly, in the production of gasoline. Built in the 1960s, primarily with Fluid Catalytic Cracking (FCC) refinery configurations that were designed to produce gasoline, European refineries currently face a product imbalance: the domestic transportation market that increasingly uses diesel rather than gasoline, partly due to favorable tax policies, while gasoline demand abroad has been weak until 2015. In addition, European consumer preferences have shifted towards more energy-efficient vehicles,  lessening the fuel demand in general. Because the majority of European refineries are not configured to processing crude oil to middle-distillate petroleum products, such as diesel, gasoil, jet fuel and kerosene, the EU’s imports of these fuels have increased. Further, until recently, European refiners have been struggling to sell their surplus gasoline on the international market. 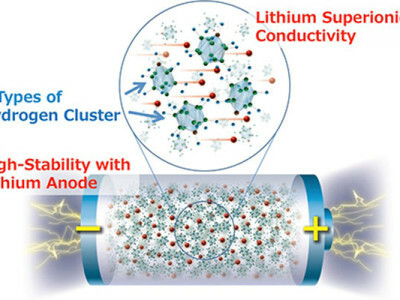 This has to do with the supply of refined petroleum products surpassing demand in many parts of the world due to the surge in new refining capacity in the U.S., Asia, and the Middle East. Exports to the U.S., which has been a major receiver of European gasoline, slowed down because of the gasoline glut built up in the U.S. as a result of the shale oil boom there in the past several years. However, the sudden uptick in U.S. gasoline demand this year helps the European refinery rally in the interim. To boost competitiveness and profitability, European refiners could upgrade their plants into Coking and Hydrocracking units to produce higher-value middle distillate products. However, such modernization requires major capital investments, cost-effectiveness of which is uncertain under the weak economic growth and higher cost of feedstock in Europe relative to the Middle East, U.S., Russia, or Asia. As the product imbalance and the changing global refining centers have shifted the fortunes of the European refining sector, local refiners point out strong regulations for slowing down the upgrades of plants and for losing global competitiveness. 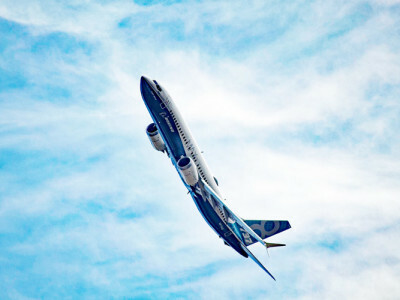 European regulations, aimed at cutting greenhouse emissions from fossil fuels and meeting best technology standards and fuel quality directives, are stricter compared to other regions of the world. The European Union’s 2030 Framework plan to cut emissions by at least 40 percent by 2030 puts an additional heavy economic pressure on refineries. The decline of Europe’s refining sector carries significant economic and energy security implications on the EU. Refining is an important source of government taxes, jobs, and energy supply security. Refining is estimated to add around 23 billion euros to the EU economies. The shutdown of any refinery results in the loss of an important revenue source and direct and indirect jobs. Employing close to 100,000 workers, the EU’s refining sector has lost around ten thousand jobs and more are at risk. Meanwhile, about 34 percent of the EU’s energy demand is met by oil and petroleum products. The EU imports nearly 88 percent of its oil, around 33 percent of which comes from Russia. The transportation sector still depends more than 90 percent on oil. The closure of domestic refineries means that Europe will be increasingly reliant on imports, thereby reducing its buffer to potential external price fluctuations. Supply disruptions due to possible accidents in refineries or instability or geopolitical events in producer countries will also inevitably affect the prices at the pump in Europe. Such price jumps will have a negative effect on the EU’s economies. In addition, the increasing ownership of flagging European refineries by foreign energy companies, particularly, by Russian firms have prompted concern in Brussels over energy supply security,  given the latest tension between the EU and Russia because of Ukraine and Moscow’s track record of using energy resources as a tool of political leverage against its energy customers. Europe’s current gasoline rally is likely to continue through the rest of 2015, particularly, when maintenance of major refineries in the U.S. and the Middle East will begin this fall and open more opportunities for European exports. However, questions about the long-term future and strategic importance of the aging refining sector to the euro region remain unanswered. Part of the European Commission’s energy security strategy of consolidating the EU’s refining capacity to improve its energy diversification and to reduce dependence on Russian oil casts uncertainty on its viability in view of the competing domestic and external pressures on the European refining sector as discussed in this article. 1. Angelina Rascouet, “Biggest Europe Oil Refiner Joins Those Predicting Boom’s End,” Bloomberg, April 29, 2015. 2. “EU Refining Industry Needs to Shrink by 40 Percent,” Reuters, November 24, 2014. 3. Christopher Johnson, “Europe’s “Ghost Town” Refineries Spook Oil Company Results,” Reuters, July 23, 2014. 4. Toril Bosoni, International Energy Agency, “Recent Developments in the EU Refining and in the Supply and Trade of Petroleum Products,” Third Meeting of the EU Refining Forum, May 22, 2014. 5. “Jet Fuel Decline May be a Preview for Europe’s Refining Margins,” Reuters, June 11, 2015. 6. “European Refining Spring Won’t Save Plants from the Axe,” Reuters, February 13, 2015. 7. “Questions and Answers on Security of Energy Security in the EU,” European Commission Memo, Brussels, May 28, 2014. 8. “Russian Strategy to Buy up Europe’s Refineries Exposed,” EurActiv.com, May 23, 2014. 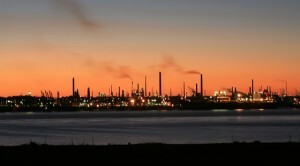 Image: Fawley Oil Refinery by Peter Facey under CC -BY-SA icense.